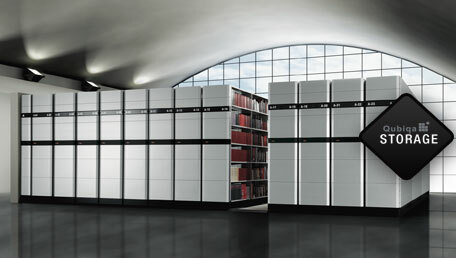 The Qubiqa solution comprises static and electronic archive and library storage systems, including a 2-tier system with unique features. Qubiqa’s solid customer list and the ability to provide a selection of unique, functional systems has been the prime reason for securing this prestigious UK order. The project covers the library and archive collections, including shelves and racks for the public floors. “The general public will have open access to material on motorised mobile shelving. This is a proven technology as in UK University libraries for many years, students have been using Qubiqa mobile shelving on a daily basis,” says CEO Axel M. Jepsen from Qubiqa. Work started on site in 2010 and the new library in Birmingham is scheduled to open in September 2013 – the facade of this landmark building consists of glass wrapped with a filigree metal design, inspired by the gasometer, tunnels, canals and viaducts of Birmingham’s industrial heritage. Qubiqa supplies shelving system for LoB.